The 2018-19 basketball season for the Minnesota Golden Gophers has been a rollercoaster ride. In a season filled with highs and lows, every significant Gopher win is followed by a meltdown that leaves the Minnesota faithful scratching their heads. Following three huge wins against power-five teams (Utah, Texas A&M, Washington), Minnesota laid an egg against an underwhelming Boston College team, a squad that sits in the sewer of the ACC. More recently, Minnesota upset #22 Wisconsin for the first time since 2009, what seems like centuries ago for fans. 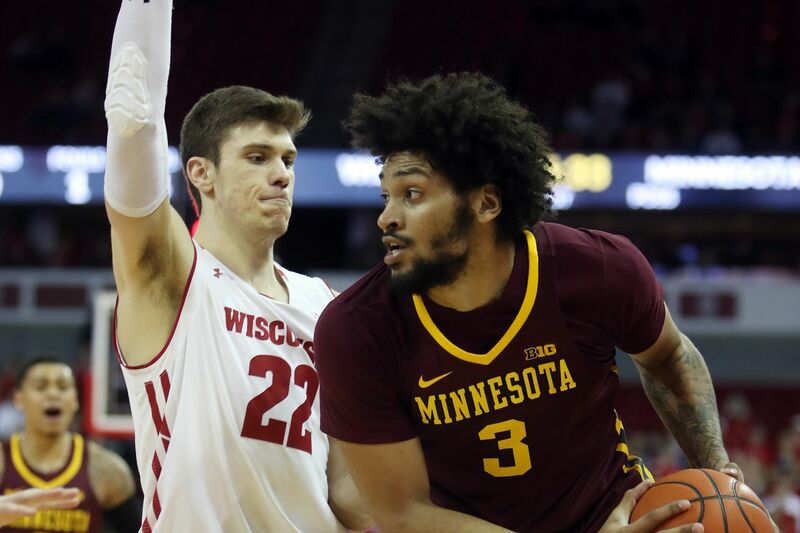 In what looked like to be a turning point in the program, the Gophers followed their victory against the Badgers with a 15-point loss to Maryland, being pounded by twenty-one in the second half. After a win against Rutgers, Minnesota faces a critical week to maintain their NCAA tournament hopes. A big week is ahead for Richard Pitino and the Gophers as he looks to bring Minnesota back to the NCAA tournament. Photo by: Geoff Burke/ USA Today Sports. As of right now, Minnesota sits on the cusp of NCAA tournament eligibility. Bracketology guru Joe Lunardi has Minnesota as a 10 seed in his latest bracket. Led by double-double machine Jordan Murphy (14.6 PPG, 12.1 RPG) and hometown hero Amir Coffey (16.4 ppg), Minnesota clearly has enough talent to make the tournament– it is about consistency going forward. Even though Minnesota’s week consists of two “cupcake” games against Big Ten teams with a combined conference record of 0-11 (@Illinois, vs. Penn St), this duo of games could be considered the most critical week of Richard Pitino’s squad’s season. If the Gophers sweep both opponents, they would sit at 15-3 and 5-2 in the Big Ten, but if Minnesota falters in even one of the next two, it would significantly jeopardize the team’s tournament hopes. In this week alone, the perception of this team could shift significantly. With two wins, the Gophers would likely continue to be regarded as a dangerous team in the Big Ten who is tough to guard with their length and athleticism. If the maroon and gold drop one or both of their upcoming games, they will likely be viewed as a team that has all of the pieces, but also features inconsistent play not indicative of a tournament team. Following this week, the road only gets tougher. After the game against Penn State, eight of the next nine of Gopher opponents are projected NCAA tournament teams. Of these teams, the Gophers face undefeated Michigan twice, a team that has suffocated every squad that has stood in their path. It would not be the first time in the Pitino era that a Gopher slip-up has proven to be catastrophic to the team’s season. Last year, Minnesota was looked at as a trendy Final Four pick. Coming into the season ranked 15th by the USA Today Coaches poll, Minnesota started 13-3. Following the off the court issues with star center Reggie Lynch, Minnesota lost focus and dropped two disappointing games to Indiana at home and Northwestern in Evanston. Following the two losses, Minnesota went 2-12, and to the frustration of Gopher fans, finished the season at 15-17. Contests against teams such as Illinois and Penn State may not be considered the most marquee matchups, but one could make the case that they are the most important for this year’s Gopher squad. Big Ten conference games are by no means easy to win, and it is paramount for the Gophers to pick up two victories this week. With daunting opponents looming, this week is make or break for the Gophers’ tournament hopes. Two wins will give the team confidence going into the big games against the top Big Ten Teams, while a loss could continue the narrative of yet another exciting but inconsistent season.